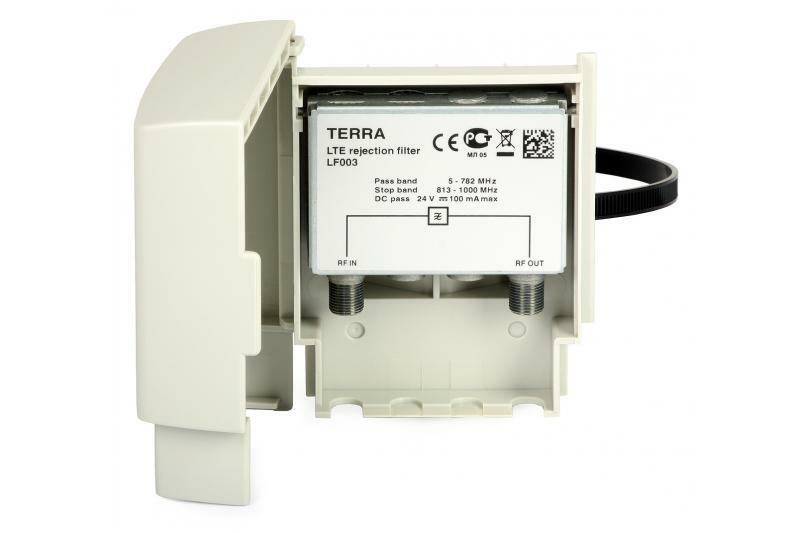 Terra LF003 LTE rejection filters are used in TV antenna systems and mounted on masts together with antenna arrays. The filter cuts off the unwanted part of the UHF spectrum (791- 862 MHz) reserved for data transmission in mobile networks (LTE). The device is especially recommended for systems with broadband amplifiers covering the whole UHF band (up to 862 MHz). In such systems, the interference from the unwanted signals can completely block the reception of some DVB-T multiplexes. Thanks to DC-pass (max: 24 V, 100 mA), it can transmit power to antenna preamplifier(s).